I’ve waited a long time to find this date. With one from 1933, I’ll have the full set. This entry was posted on 1 May 2015 at 12:04 am and is filed under 1943. You can follow any responses to this entry through the RSS 2.0 feed. You can skip to the end and leave a response. Pinging is currently not allowed. How do you know what a full set is? Do you mean the years which the contractor was active? If so, how do you find out the history of the contractors and their work areas? In general, I don’t know because I’m mostly just walking around. But there’s research I can do, mainly looking in old city business directories to see if someone is listed. As for Douglas & Wolfe, 1926 is the oldest mark I’ve found, and with about 80 percent of city surveyed, I’m pretty sure I won’t find anything earlier. And I know that in 1945, Douglas & Wolfe changed into R. G. Wolfe. Thanks for the reply and info, Andrew. Do you find these city business directories in the library, in city hall, or in second hand stores? I love seeing these marks around Los Angeles. 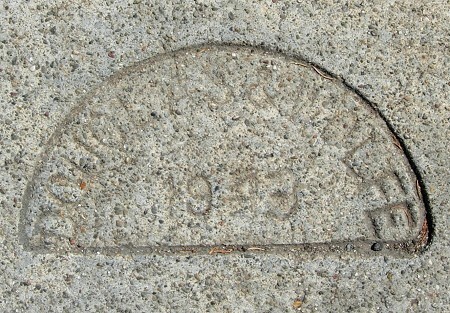 The earliest one I’ve seen, on a sidewalk in front of a row of old Craftsman houses on 1st street, is from 1915. The largest and most elaborate was on Hollywood Boulevard and was about 2 feet square and showed the image of a two story house with a brick chimney.